Strings Theory Trio: directed improvisation composed and performed by Mimi Rabson (five string violin), Helen Sherrah-Davies (five string violin), & Junko Fujiwara (cello). Rescheduled CD Release Concert, Wednesday, January 20, 7:30 pm. Free. StringsTheoryTrio; photo credit David Wallace. BOSTON - Jan. 4, 2016 - PRLog -- Strings Theory Trio: Rescheduled CD Release Concert; directed improvisation composed and performed by Mimi Rabson, Helen Sherrah-Davies, and Junko Fujiwara.Wednesday, January 20, 7:30 pm. Free and open to all. David Friend Recital Hall, 921 Boylston St., Boston, MA 02115. For information: 617-710-5932, www.berklee.edu/events/strings-theory-trio. Strings Theory Trio,founded by violinist Mimi Rabson,dances on the fine line between composition and improvisation. Combining idiomatic flexibility, a deep wellspring of creativity, and world-class virtuosity, Rabson is highly acclaimed as a valuable musical resource for the Boston area. Her most recent recording with Strings Theory Trio is a uniquely compelling synthesis of classical chamber music and directed improvisation, bringing together some of Rabson's most important influences and inspirations. With Rabson and Helen Sherrah-Davies on five-string violins and Junko Fujiwara on cello, the trio supercharges the intimate atmosphere of chamber music. Their surging counterpoint and crystalline instrumental sonorities gain new allure from their origin in the inspiration of the moment. Simultaneously delicate and dangerous, Strings Theory Trio is richly nuanced and deeply satisfying. This CD release concert had originally been scheduled for last January, but due to the unpredictable and dangerous weather conditions, it needed to be cancelled. The weather prediction for this time around will be perfect, with a repertoire of original compositions to match: "Cellist’s Revenge" (J. Fujiwara), "Kat Kopanica" (H. Sherrah-Davies), "Flashback" (M. Rabson), "Marking Time" (M. Rabson), "What’s My Line" (J. Fujiwara), "Too Few Views" (M. Rabson), "Paradox" (H. Sherrah-Davies), "Nirvarky" (M. Rabson), and "Metalyptica" (M. Rabson). A sample of their most recent recording project can be viewed at www.vimeo.com/soamel/stringstheoryflashback. you are thrilled to be on ..."
Strings Theory Trio (www.mimirabson.com/mimirabson.com/Strings_Theory_Trio.html). 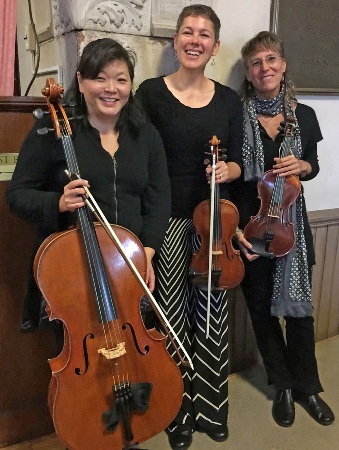 With leader Mimi Rabson’s five-string violin and the equal voices of Junko Fujiwara on cello and Helen Sherrah-Davies on five-string violin, the Trio supercharges the intimate atmosphere of chamber music with a triple dose of edgy, daring improvisation. Listening to these virtuosi, one hears Western classical tradition anew; the surging counterpoint and crystalline instrumental sonorities gain new resilience and allure from their origin in the inspiration of the moment. Simultaneously delicate and dangerous, the Trio’s music is richly nuanced and deeply satisfying.